Activity Checks of Claimants / Defendants to determine their employment status and recreational activities. Asset Searches, including prior bankruptcy filings, liens, judgments, real property, bank accounts (with an existing judgment) and motor vehicle ownership. Background Investigations on potential business associates, employees or others, including research of public records in County, State and Federal Courts, to determine possible criminal/civil history, or the existence of pending civil actions. Computer Forensics to find out just who your son/daughter is chatting with online, protect your family members from online predators, and uncover hidden identities. Copyright / Patent Infringement investigations to determine who is illegally using your products, where and how they are doing so, and legally require them to cease and desist. Death Investigations to determine cause/contributing factors to death by interviewing witnesses, examining records, contacting/interviewing family members, previous employers, etc. Domestic Investigations including surveillance on divorce or child custody matters. Elder Abuse Investigations to ensure your loved ones are being cared for in a compassionate, caring and humane manner. Exaggerated/Fraudulent Claims to determine actual losses and damages suffered by the claimant by locating and interviewing witnesses, examining records and placing the claimant under surveillance to determine social, recreational and employment activities. Identity Theft Investigations, including how to protect yourself and your family and guide you through the process if you are a victim. 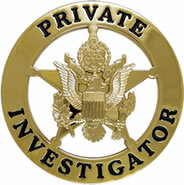 Locate Investigations to locate/interview witnesses on pending actions, locate missing persons, etc. Pre-Employment Interviews to evaluate the candidate's suitability for employment with your company or in your home. This is especially important for potential caregivers. Pre-Marital Investigations to determine if he/she is really who they say they are!! Process Service of State and Federal Subpoenas, court orders, etc. Product Liability to determine if losses or injuries suffered by the claimant/plaintiff are a result of product design, misuse of product, etc., by inspecting product involved, examining purchase/maintenance/repair records, interviewing witnesses, and determining circumstances surrounding incident. Records Searches to determine if the claimant is a "professional plaintiff". Tenant Screening to confirm the details provided by your potential renter. Traffic Collision Reconstruction to determine responsible party and circumstances of collision.